The Division of Communications was created by action of the Southern Illinois University Board of Trustees in 1953. C. Horton Talley was named Director of this Division. Two years later, the name was changed to School of Communications. In 1970, the Board of Trustees merged the School of Communications and the School of Fine Arts to form the College of Communications and Fine Arts. This College lasted twenty-three years. In 1993, the Board split the Departments of Radio-Television, Cinema & Photography, the School of Journalism and WSIU from the College of Communications and Fine Arts, to form today’s College of Mass Communication and Media Arts. The other departments in the old CCFA, Communication Disorders and Sciences, Speech Communication, Theatre, and Art and Design, are now housed in other Colleges. In the first two years of existence, our new College revamped curriculum, added computer labs, new production equipment and spaces, and organized student internships around the country. This emphasis on keeping the cutting edge remains our focus today, as we expand our fields of study into new areas emerging in the 21st Century. In the first decade of the 21st Century, the College added numerous faculty members in specializations like Media Industries, Animation, Cinema Studies, Photography, Documentary, online Journalism, Video Production, Advertising, and Intermedia Arts. For more than two decades CMCMA has continued to provide an outstanding comprehensive media education in all forms of Media Communication. Graduates of our College span the globe, working in all sectors of the communication industry and in education. Leadership marks our College’s history; innovation shapes our future. 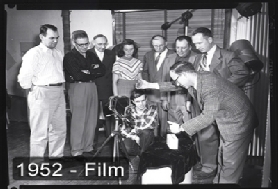 Before we were MCMA: Students in a film class in 1952.